The 2018 season is just about here so it’s time for the release of my annual full Michigan season prediction. I’ve done decent at best in the past, a little optimistic at times but haven’t been more than two games off and nailed the record for 2016. So, for this year, whataya know, nothing’s changed. While I’m not guzzling the maize and blue Kool-Aid, I am sipping on it a bit. Some act like it’s impossible for Michigan to finally get over the hump and beat its rivals. For Jim Harbaugh to “prove his worth” and win a championship. For anyone to survive this daunting schedule. For an 8-5 team to make a run the following year. Well, it’s not like it hasn’t happened in a pretty similar situation before. In 2009, the Auburn Tigers went 8-5 and fired Tommy Tuberville. In 2010, newly hired Gene Chizik and his SEC transfer quarterback, Cam Newton, led Auburn to a 14-0 season, including wins over Clemson, LSU, Georgia, and a win at Alabama, leading to an SEC title and a National Championship. The Michigan defense is elite, the quarterback is a playmaker, the offensive line should be simplified, and the top talent is another year more mature and stronger. This is the most talented team Jim Harbaugh has had in Ann Arbor and I believe it could do big things. But as a longtime fan that’s been burnt in the past, I know they can break hearts too. That’s why even I’m skeptical about my prediction here. There aren’t many teams on Michigan’s schedule that were hit harder with NFL departures than the Fighting Irish. Two top-10 offensive linemen in Quenton Nelson and Mike McGlinchey, the team’s leading rusher in Josh Adams, the team’s leading receiver in Equanimeous St. Brown, the team’s top tight end in Durham Smythe and the team’s 2nd leading tackler in Nyles Morgan. But they still return a ton of talent and have Brandon Wimbush under center, who will look to bounce back after a rough second half of the 2017 season. Wimbush will have a nice set of tall receivers and tight ends to target but where he’ll likely make his biggest impact with his feet. He was the 2nd leading rusher for Notre Dame last year and Michigan has historically struggled with dual-threat quarterbacks that can rip off big chunks on designed plays and scrambling situations. Don Brown has had eight months to prepare for this exact thing and though I imagine Wimbush getting free from time-to-time, I see Michigan’s speed at the linebacker and defensive end positions eventually keeping him in check. Notre Dame returns nine starters from the 47th ranked defense last year and will likely give Shea Patterson and the new look Michigan offense some troubles, especially if Ed Warriner’s offensive line has any struggles. However, the mix of Patterson’s dual-threat ability, mixed with a veteran running back duo and talented receiving group, I see the Wolverines breaking off some big plays in South Bend. This could be just the start to big seasons for the 2, 12, 22 trio. Like every big season opener, there will be plenty of momentum swings in this game through big plays, turnovers, and mistakes. That could include an interception or two from both quarterbacks. But I see Michigan limiting theirs, the defense scoring at least once, and Shea Patterson finding a groove with his arm and legs, leading the Wolverines to a convincing rivalry win on a rainy night in front of a national audience. Gone are the days of Row the Boat but the Broncos are still one of the more talented teams in the MAC thanks to Fleck’s recruiting. Western didn’t have a very good year in Tim Lester’s first year at the helm, finishing 4th in the division at 6-6. But the Broncos return a decent amount of injured talent this year, including quarterback Jon Wassink and running back LaVante Bellamy. There are playmakers there but with having to replace All-American OT Chukwuma Okorafor and a change at offensive coordinator, I see the defense having a big day. The same could be said for the offense as Shea Patterson will get his first taste of the Big House and should put up some big numbers on Western’s secondary that took a huge hit when CB Sam Beal entered the Supplemental Draft. Look for Pep Hamilton and Jim Harbaugh to take advantage of a very young front seven. This could be a coming out party for Nico Collins as well as the first look at Brandon Peters, who may get his first chance at mop-up duty. Michigan couldn’t put away anyone early last year as missed opportunities were a theme all season long. That won’t be the case here as they pull away from the Broncos in the first half and cruise to a comfortable win in front of a packed Big House crowd. New head coach Sonny Dykes comes over from Cal to take Chad Morris’ place, who took the Arkansas job after Brett Bielema was fired and is now on the New England Patriots staff. Still with me? Ok good. SMU comes to town looking to pull off a huge upset but instead walks into a buzz saw on both sides of the ball. The Mustangs will have eight starters coming back from the 121st defense a year ago. So, I don’t expect it to be that bad but I do expect it to struggle in this game. The secondary was picked apart last season and should be again against this passing offense. Look for Zach Gentry, Donovan Peoples-Jones, and Grant Perry to have huge days. On offense, Southern Methodist lost its best offensive weapons in 2nd round pick WR Courtland Sutton and 7th round pick WR Trey Quinn, which means they’ll be breaking in some inexperienced receivers. Junior quarterback Ben Hicks may flash at times but he should have a very tough day. Expect a big game from the defensive line and Khaleke Hudson thanks to the secondary’s coverage on the young receivers. Five touchdown passes and two rushing touchdowns lands Patterson plenty of recognition and the Wolverines offense has its best scoring output since the 2016 blowout of Rutgers (78-0). The return of everyone’s favorite college quarterback, Scott Frost, will be one that gets a ton of hype. This will be similar to the Purdue game a year ago as the Cornhuskers get off to a nice start on the season. And while I think Frost will end up being a really good hire, I do think it’ll take a little time for him to get his guys to Lincoln. Freshmen QB Adrien Martinez is talented and dynamic but still a freshman. Look for Don Brown to give him a ton of different looks in front of a sold-out Big House crowd to truly welcome him to college football. Like most dual-threat quarterbacks, I expect him to have his moments but the veteran leadership and pure talent on defense will get it figured out and lock things up for the Wolverines. If the defense locks it down, this one could really get out of hand. Nebraska had the worst defense in the Big Ten in 2017 and doesn’t return a ton of talent. New coaching can do big things for a defense but I don’t know if they have enough dudes to hang with Michigan’s talent on offense. Big games from both the running and passing games lead the Wolverines to a nice win. The first scare of the season comes from the most obvious first half option. Northwestern is always a problem for Michigan and even more of a problem in Evanston. Add in the chance to pull off the huge upset and Pat Fitzgerald will have his guys ready to rock. But like in years past, the Wolverines sneak out with a close call. The Wildcats are coming off a 10-win season and should continue to be around a 10-win team every year. They have plenty of talent and they always play hard. Quarterback Clayton Thorson blew out his ACL in the bowl game and looks close to being ready for the season. Even if he isn’t, he should be ready by the time this game rolls around. And it should give their offense a boost. However, with Justin Jackson in the NFL, I don’t think there’s enough firepower to outweigh Michigan’s defensive talent and offensive output. The Big Ten’s worst pass defense in 2017 lost three starters and the defense, who played well down the stretch last year, returns six starters overall. It’ll be good but I see the Wolverines offense catching fire in the second half and Patterson connecting on multiple deep balls as the Northwestern defense sells out to stop Karan Higdon and Chris Evans. This could be the game where Patterson sees some struggles and turn the ball over trying to make too big of plays. But after some adjustments, Michigan’s offense and defense come back from a first-half deficit and then hold on for a hard-fought victory on the road. Maryland will likely have Matt Canada as head coach in this game as it’s likely former Michigan defensive coordinator DJ Durkin is fired with everything going on in College Park. With all of the turmoil and changes right before the season, I can’t imagine this game being much of a contest. Though Maryland has signed a top 20 class in 2017 and a top 30 class in 2018, the talent is very young, inexperienced and now relying on a lot for young players. The offense finally gets back injured quarterbacks Tyrell Pigrome and Kasim Hill, both of which could give any defense fits at times. But I just don’t see enough offensive talent to put up much of anything against a now extremely confident defense. The defense will feature transfers DL Bryan Cowhert (Auburn) and CB Marcus Lewis (Florida State) join what should be a pretty solid defense. The talent could flash for Maryland but I see this being another blowout for the Wolverines over the Terrapins. Though I believe this team could run the table, I’m not ready to predict it. The schedule is really tough and this game especially will be extremely tough as Wisconsin is super legit. This game will be the headliner of the week like it was in 2016, and an absolute battle like that game as well. Only this time, I don’t see it going as well. While the defense is always good, it’s the Badgers offense that should be the gamechanger this year. They just might have the best offensive line in the country (shocker, I know), a top-flight returning quarterback in Alex Hornibrook, and the Big Ten Freshmen of the Year at running back in Jonathan Thomas. Though one of their top receivers, Quintez Cephus, is out on suspension, the passing game should still be dynamic. This will be one of the toughest challenges of the season for the talented Michigan defense. The game should be a slugfest as both teams try to set the tone with the running game. Strong games from Jonathan Taylor and Karan Higdon while Hornibrook and Patterson both have their ups and downs. Turnovers and big special teams plays will be the name of the game as it comes down to a heartbreaking last-second play. A Shea Patterson scrambling hail mary is broken up as Michigan suffers its first loss of the season and the Jim Harbaugh-big game questions pop back up. But only for a week. Another monster game on the schedule, the third of the season for Michigan and one every in-state fan badly wants to win. And though State will have the home field advantage, Michigan will have the mental edge as revenge is on the mind coming off a big loss to Wisconsin while State is riding high after a big win over Penn State. Quarterback Brian Lewerke is another future NFL quarterback for the Spartans and will have a big season. His arm is good but his feet is what can kill Michigan, as it did at times last year. Getting running back LJ Scott and receiver Felton Davis back is big for the offense as well. But a forced fumble on Scott and an interception off of Lewerke from Khaleke Hudson are game changers. Add in big games former five stars Rashan Gary and Aubrey Solomon, and the Michigan defense flexes its muscle. The Spartan defense is no slouch itself. Even with much-improved quarterback play, the MSU defense stifles the Michigan offense throughout the first half. 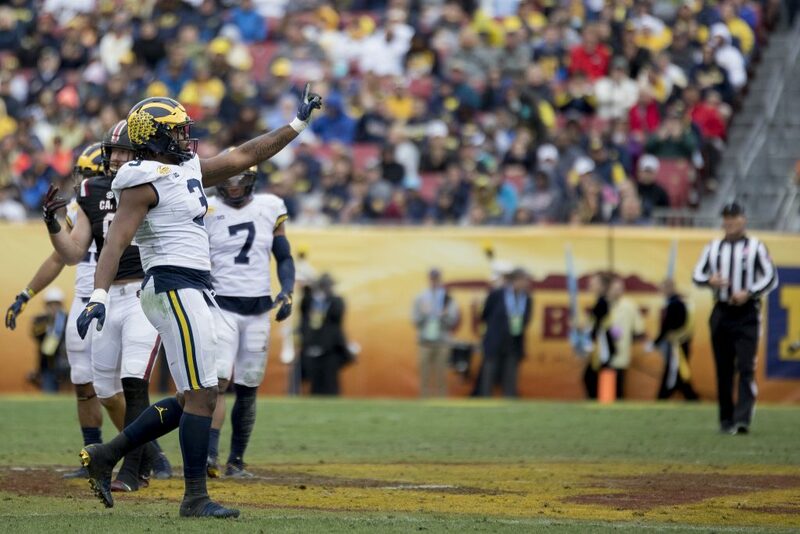 But big days on the ground from Patterson and Evans open up the offense for explosive plays through the air for Zach Gentry and Donovan Peoples-Jones. This will be a game of runs and hard hits. Look for a lot of trash talking and scuffles. It’ll be a Big Ten class as the game-winning Patterson touchdown run is set up from a 4th quarter Donovan Peoples-Jones punt return. Oh, and like I mentioned in my Bold Predictions for the 2018 Season, Winovich goes crazy when he gets the Paul Bunyan trophy and accidentally breaks it. Some key injuries are almost guaranteed by time point in the season. This break comes at a great time as the highly ranked Wolverines’ injured players could get the chance to heal up ahead of another tough test. What will Michigan's record be at this point? This is the game I’ve gone back and forth on several times while putting this prediction together. Penn State has been an analyst favorite this offseason even after losing the best player in the Big Ten last season, 9 of 11 starters on defense, and its offensive coordinator. And that’s mainly thanks to the return of senior quarterback Trace McSorely. The popular Heisman trophy pick is easily one of the top talents in the Big Ten and a player that will put up big numbers with or without Saquan Barkley. But without an all-time running back talent, it’ll be a lot tougher against this Michigan defense. Miles Sanders will pick up some of the slack from Barkley in the backfield while Juwan Johnson should be a playmaker on the outside in place of Mike Gesicki and DaeSean Hamilton. But will there be enough? If Michigan loses this one, there will be calls to rip out the blue endzones after a second home loss of the season. But I’m having trouble seeing that happen with the firepower Penn State lost this offseason and the fact that it’s a home game for the maize and blue. This one will be another classic between the two best jerseys in the Big Ten but this time it’ll be the Wolverines coming out on top. I see this one going to overtime with Penn State being held to a field goal followed by Shea Patterson scrambling home for the walk-off winner, locking him into damn-near legend status among some fans. No matter the record, this game comes at a good time after three straight top 25 battles. Michigan needs to use this game as a way to rest up some of the starters and get a lot of the young talent much deserved time. Though the Scarlett Knights won’t be as bad as in the past couple of years. True freshmen quarterback and former Michigan recruit, Artur Sitkwoski, is a talented player. He won’t have a ton of help on the offensive side of the ball this year but he should still flash throughout the season and this game. That doesn’t mean I expect him to show out, especially with Don Brown getting eleven games already on film. That’s why I expect Rashan Gary, Khaleke Hudson, and even Aidan Hutchinson to have some big games against a shaky Rutgers o-line. The Scarlett Knight defense was ranked 72nd in 2017 and returns eight of its starters. It’s the best part of the team but still shouldn’t be able to hold up against an offense nearly clicking on all cylinders. If everything goes as planned, Shea Patterson will only have to play the first half and give quality time to both Brandon Peters and Dylan McCaffrey. Look for the other young offensive and a lot of defensive talent to see time in this one as Michigan coasts to another big win over Rutgers. Make it 23 in a row as Michigan beats up on Indiana in Tom Allen’s second chance to break the streak. Though the Hoosiers always like to give the Wolverines a hell of a fight in Bloomington, this game is in Ann Arbor and should have a rowdy crowd as it’s the last home game of the season. It’ll likely be Peyton Ramsey at the quarterback position, though freshmen Mike Penix is another name to watch if the season goes south. All of them bring a different dynamic to the position but none should scare Don Brown very much. Add in the lack of offensive firepower in the backfield and at the receiver position outside of RB Morgan Ellison and potentially WR Nick Westbrook, and I don’t see them doing too much against Devin Bush, Tyree Kinnel, and company. The defense lost its top two linebackers but have talent returning and coming in via transfer. They may hold Michigan a couple times and cause a turnover or two but with everything on the line a week from this point, the Wolverines collect themselves and catch fire in the second half behind a dominant offensive line and a big day on the ground for the two-headed monster at running back. This might be a popular trap game for opposing fans, radio hosts, and analysts to pick but I see Michigan taking care of business and giving their fans a warm feeling going into The Game. With or without Urban Meyer, I felt like Jim Harbaugh and Michigan would finally get over the hump this season. And now that he’s officially coming back (though who knows where things will be with this story by then), regardless of what I think of the whole situation, I still firmly believe Michigan can win and (obviously with the prediction) will win this game. Dwayne Haskins is getting a ton of praise and rightfully so. He’s got all the physical traits and showed it against Michigan last year in place of JT Barrett. Though I think some may need to pump the breaks a bit on his Heisman hype, he should take a big step forward as a first-time starter. Add in his talented, deep group of receivers and the star running back duo of Mike Weber and JK Dobbins, and the offense will be unreal once again. Last year, Michigan had a 14-0 lead with John O’Korn doing his best at quarterback and were a dropped interception from it being 21-0 in the first half. So, it’s hard not to imagine Shea Patterson, a more experienced receiver group (with Tarik Black potentially back from injury) and what has to be a better offensive line, not doing some damage on what should be another very good Buckeyes defense, but one that lost good amount of talent and production to the NFL last year. For the Buckeyes, luckily this game is at home as opposing fans are likely going to ridicule Urban Meyer and Ohio State non-stop in the aftermath of the Zach Smith mess. But I don’t think the home crowd will make enough of a difference. Don Brown’s game planning and the speed on the Michigan defense has shown the ability to keep the game close in the past. This year’s defense is even better and the offense should be 10x better than 2017’s. This could be another classic between the hated rivals, one that could come down to the final possession. Two of the nation’s best will battle it out for the third straight year but with a quarterback able to hit open receivers on key plays and a more polished defense, I see Michigan finally getting revenge on the Buckeyes and punching that ticket to Indy for the Big Ten Championship. Revenge is on the mind of the Wolverines. The Big Ten Championship features two top five teams after Wisconsin finishes the regular season undefeated thanks to a soft schedule and an elite running game. And it should show out in this game as Jonathan Taylor leads the Badgers offense to a fast start. But thanks to Don Brown adjustments and the offensive catching fire in the 2nd quarter, this is a one-score game throughout. After a huge stop late in the 4th quarter, Michigan moves the ball quickly into field goal range. That’s where Quinn Nordin nails a 40-yard field goal with no time remaining to give Michigan its first Big Ten title since I was in high school (2004) and send the Wolverines to the College Football Playoff. Will Michigan Make the B1G Championship Game? Michigan heads to Jerryworld for the second straight year but this time it’s in the Playoff and it’s against the defending National Champs. But Harbaugh’s first crack at Saban doesn’t go as planned. The Crimson Tide players and coaches have an edge in the huge game experience and it’ll show in this game. Inexperienced mistakes and turnovers cost the Wolverines on the biggest stage. The defense will keep it close in the first half while the offense stalls. A third-quarter burst behind big plays from Zach Gentry and Karan Higdon brings Michigan back. Tying it up early in the 4th quarter, Alabama flexes its muscle and forces a turnover to put the game out of reach, ending Michigan’s magical season. I like Alabama to repeat as National Champions after knocking out Michigan. Will Michigan Make the CFB Playoff? This is a very tough team to predict. There’s a ton of unknown and a ton of potential. I could see 1-2 more heartbreaking losses during the regular season but I could also honestly see them run the table. This team is crazy talented and thanks to all of the offseason moves with the coaching staff and addition of a playmaker like Shea Patterson, I could see them taking a huge step forward this season. The schedule is the main thing that stands in the way and while it is ridiculously difficult, I’m not sold on all four heavy hitters in the Big Ten East being elite teams this fall. Remember: The 2016 team was a controversial spot away from being in the same scenario. Even with the Tarik Black injury, this team is talented enough to win every game on the schedule. If Patterson plays up to potential and the defense is elite as expected, it could be a dream season in Ann Arbor. If injuries pile up and the offense can’t find a way to grind out some close wins, it could be another underwhelming year. Since I’m a pretty optimistic person, I’ll lean towards the stars aligning and the big year finally coming to Jim Harbaugh and the Wolverines.